This egg sandwich is special enough for a weekend brunch, but quick enough to assemble for weekday mornings; baking the eggs instead of frying adds to the ease. 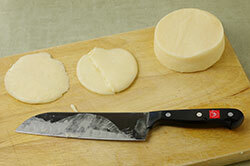 If you don’t have Manchego cheese, try using a sharp white Cheddar. 1. Preheat oven to 375°F (190°C). 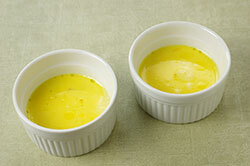 Lightly grease two 6-ox (185 g) ramekins with 1 teaspoon oil total. 2. In a bowl, scramble eggs lightly with milk. Divide mixture between ramekins. Bake just until eggs are puffy and set, 15-18 minutes. 3. Near end of baking time, place a cheese slice on bottom half of each toasted muffin. Place cheese-topped muffins on a rack in hot oven until cheese melts slightly, 2-3 minutes. Remove from oven and set aside. 4. Meanwhile, heat 1 tablespoon olive oil in a frying pan over medium heat and add garlic. Cook about a minute, just until garlic sizzles and is fragrant. 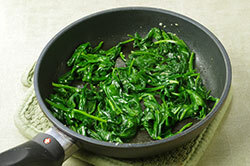 Add spinach leaves and cook, stirring, just until wilted, 30 seconds -1 minute. Remove from heat and discard garlic clove. 5. 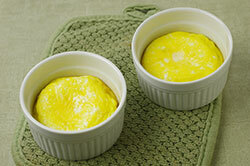 Remove ramekins from oven and let cool slightly. Carefully run a paring knife around inside edges to release eggs. 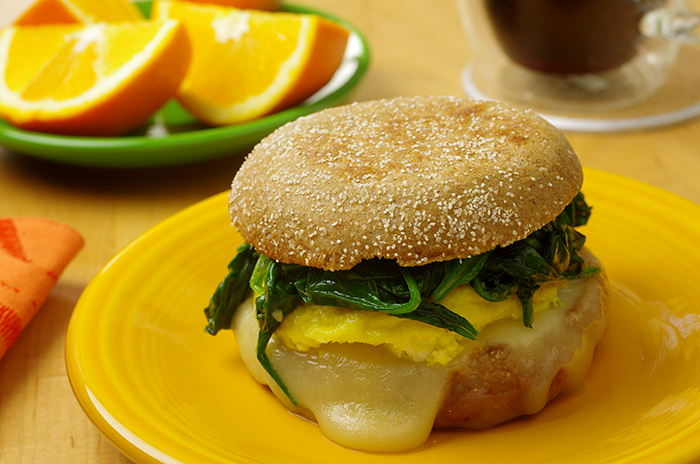 Turn out each egg portion onto a muffin, on top of melted cheese. 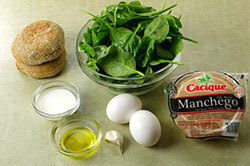 Mound equal portions of spinach over eggs and then cover with muffin tops. Eat immediately, or wrap loosely in waxed paper and take to go. This recipe is a lighter take on a fast-food favorite. 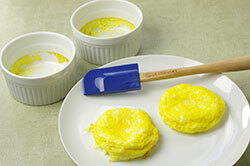 To reduce the fat even more, omit the cheese and swap in 2 egg whites for 1 of the eggs.